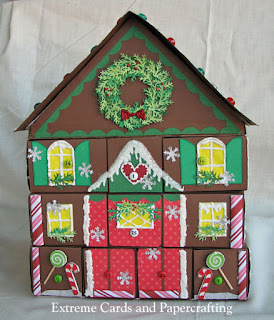 Several weeks of work and a LOT of paper later, I have completed my gingerbread advent calendar from paper boxes. The front has a tall door with dimensional snow paint outlining it. The wreath is made from punched branches. I covered the gable end with a triangle of brown paper and scalloped trim. Windows are cut from yellow waxy paper. The candy sticks are made from striped paper rolled diagonally into a tube. Drawer pulls are small brads fastened through each drawer front. The roof is decorated with snow writer paint and melted pony beads. I cut the tree from a piece of scrapbook paper and then cut it apart to fit the drawers. 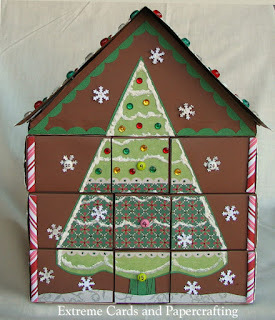 It is decorated with Stickles glitter and jewels. 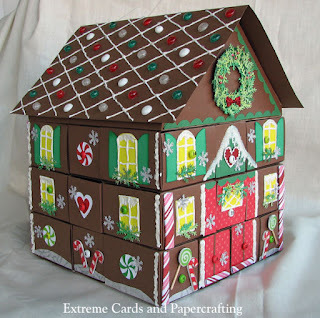 If you would like to make this papercraft, start with this post. It has the matchbox style box patterns. Then refer to this post, which has the construction diagrams. Click here for cutting files for some of the decorations I made (SVG, PDF, Silhouette Studio). 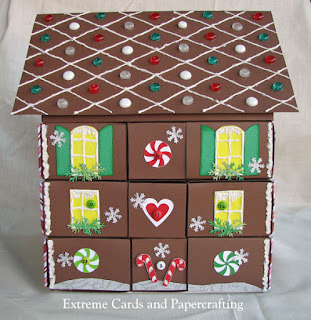 Included are the front door, windows and shutters, pinwheel candies, starlight candies, candy canes, hearts, and scalloped trim. Size the file to 10" x 10". Delete the sizing square before cutting. Files are free. A huge thank you to the many readers who support my site with a small contribution. Pay what you wish for the tutorial and to support this site. Suggested contribution for this portion of the project is $1.00. Here are some of the products and tools that I used: pony beads (melted), Deco Art Snow Writer and Glistening Snow Writer, assorted brads, snowflake punch, branch punch, Stickles (it's not marked but it looks like Cranberry).